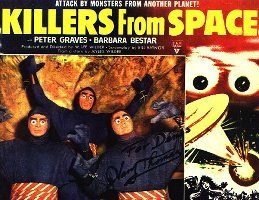 Killers From Space was the first of Harry's movies that I saw as a kid. The plot involves space aliens with ping pong balls for eyes creating giant lizards and grasshoppers to take over the Earth. Who could ask for more in a science fiction movie? 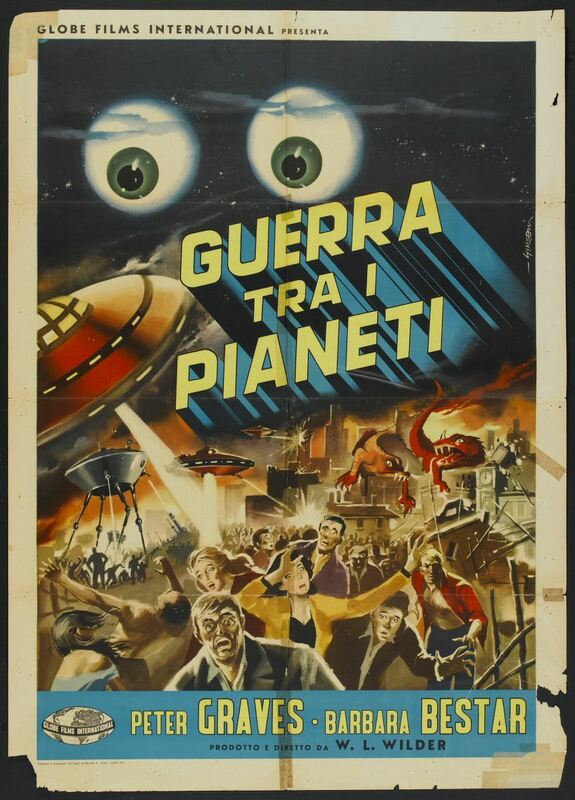 My Italian poster is one of the most colorful posters available from this movie. This lobby card shows the aliens waving to the people of Earth. Peter Graves stars as the first human to receive open heart surgery with a cutting torch. Harry posed for these pictures for an article in Filmfax Magazine (July 1990). 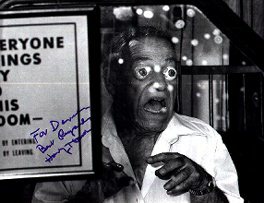 Harry Thomas comments on Killers From Space: The director wanted the space aliens to have large, protruding eyes. An optical shop said that it would cost at least $900 to make eight pairs of glass eyes for the movie. The producer rejected the cost right away, and then someone suggested using ping pong balls. I decided that I would not use ping pong balls for this. They're much too thin and they don't have or the depth that I need for the sclera of the eye. I spent that night and most of the next morning wondering how I'd make realistic eyes for these aliens. I was almost completely discouraged when I went to get something to drink from the refrigerator and there was my answer- a white plastic egg tray. The plastic tray had the perfect shiny, almost translucent appearance that I was looking for. I yelled, I've got it, I've got it.....laughing and dancing around like a fool. I sliced the bottoms of the tray off with a heated screwdriver, leaving me with half-spheres of plastic. I pierced the center of each one with the heated screwdriver, so the actors could see. Then, I painted Irises on them, and drew in some red blood vessels. The producers wouldn't give me enough time to make the eyes and the aliens effective. I wanted to blend the edges of the eyes with a flesh color, to create a more lifelike effect. There were only a half dozen aliens, so it wouldn't have taken very long, but they just said, "Well, it looks all right." I also wanted to give the aliens long, pointed beards and have them speak into a vacume. This way you could still understand the aliens, but they would sound different from Earth people. I spoke with the sound man about this and he said that he could do it. But they wouldn't take the time, so the aliens sounded like they came from Oxford instead of from outer space. The director did allow me the time to create one effect. The director kept telling me to "hurry up, hurry up," I told him that this would only take a minute and he would love the effect. 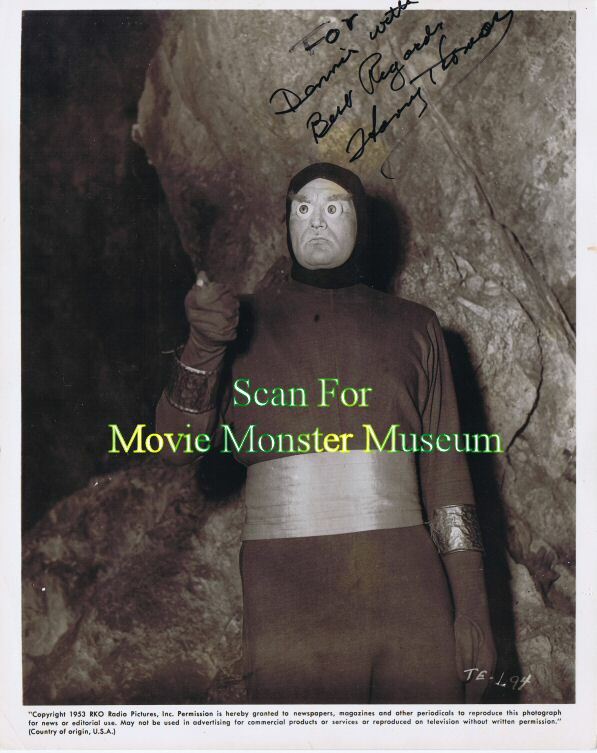 If you watch the head alien while he's giving his long speech to Peter Graves in the cave, you'll see his eyes move....just a little. I did this by placing a second set of eyes, thinner than the first set, over his original alien eyes. 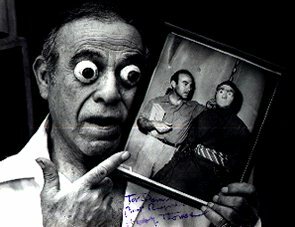 Then, I attached fine wires to the edges of each eye and very carefully moved the eyes for the camera. I knew that these types of pictures would be remembered for the makeup It wouldn't be for the hackneyed stories or the poor acting; it would be for the makeup.